IT IS ONE OF the best known and loved of many tales from the sub-continent. The story of ‘Heer’ and ‘Ranjha’ is about to become a stage musical. The Punjabi star-crossed lovers who have been immortalised in poetry, song and film are now been given a makeover for the stage and will be at Sadler’s Well London from Thursday (September 7) to Saturday (September 9). Called, ‘Ishq’ (Love) this tale of two lovers and their feuding families is the brainchild of Serendip Productions run by the husband and wife team, Farooq & Huma Beg, and is part of the 70th anniversary of Pakistan independence celebrations. Farooq Beg, who is also directing told www.asianculturevulture.com that he has heard the story from his childhood and regards it as a tale of a “woman who challenged her patriarchal society and shook it to the bone”. Most South Asians, he explained, associate the story of Heer and Ranjha from the work of the 18th century Punjabi Sufi poet, Waris Shah, who wrote the romance after he fell in love. However, the original tale is much older, and people say that Heer and Ranjha were real people who lived during the Lodhi dynasty that flourished during 1451-1526 and could have even inspired Shakespeare’s ‘Romeo & Juliet’, originally published in 1597. Briefly it’s the tale of a high-born girl, Heer who hears Ranjha playing the flute and they fall in love. But both are from different tribes and villages but their love is thwarted by Heer’s wicked uncle and she is duped into marrying another. Ranjha goes into the desert and becomes a wandering mendicant and it is his name, ‘Ranjha’ which has become a word used to describe somebody passionately in love. The couple are said to be buried in Heer’s home town of Jhang (Pakistan) and is visited by couples in love, just as Juliet’s Balcony in Verona is by love struck tourists. Ali, who trained at Arts Educational and can sing, dance and act, told ACV: “I was really interested in this version which is a mixture of Eastern and Western music and style of acting. The Heer story songs are essentially in English with a handful of Punjabi, she said, ‘Ishq’ is to be performed in English and features both UK and Pakistani creative and production talent. 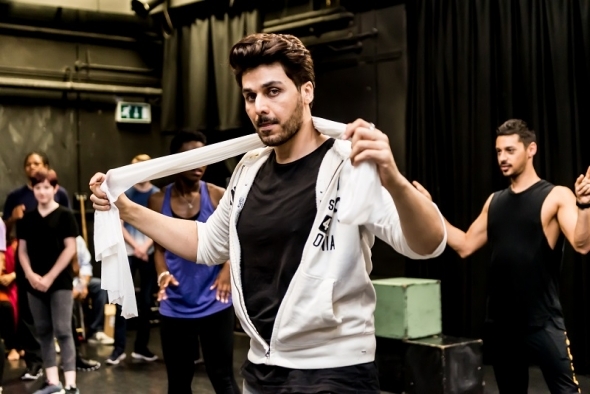 The British Pakistan actor, Ahsan Khan plays Ranjha, and the script for this show is by Mushfiq Murshed and is described as a “multicultural Sufi musical”. It has a new music score by Ian Brandon and Pakistani composer, Emu (Fuzon), to bring about the authenticity. The choreography and dramaturgy are by Owen Smith while the associate producer, is Tara Finney Productions. However, the driving force is clearly the Begs who have a great background in arts and cultural work. Farooq originally worked as a NHS doctor, then went on to make documentaries for Yorkshire Television, but when he met his wife Huma (also the producer and production designer) the couple moved back to Pakistan. There they started presenting live site specific Sound and Light shows as a way of raising awareness of the old forts in Pakistan and finding a way of creating sustainable development projects. One thing led to another and today, Beg is passionate about using arts and culture as a way of talking about women’s issues, empowerment and gender equality. ‘Ishq’, he says is a story which can be seen on two different levels – on the one hand it is a tragic romance and part of the folklore of Punjab yet on another, this is the story of Sufism, about the quest about the nature of divinity and true love.